When upgrading from Day One Classic (Version 1.0) to the latest version of Day One, follow the instructions below to import your data. Before starting, be sure that your journals and entries are downloaded and available in Day One Classic on the same device where you have downloaded the latest version of Day One. If your entries are not in Classic, Please contact our support team and we will work with you. If you need to redownload Day One Classic first, look for it in your App Store Purchase History by following the instructions in this article: How do I download Day One Classic? 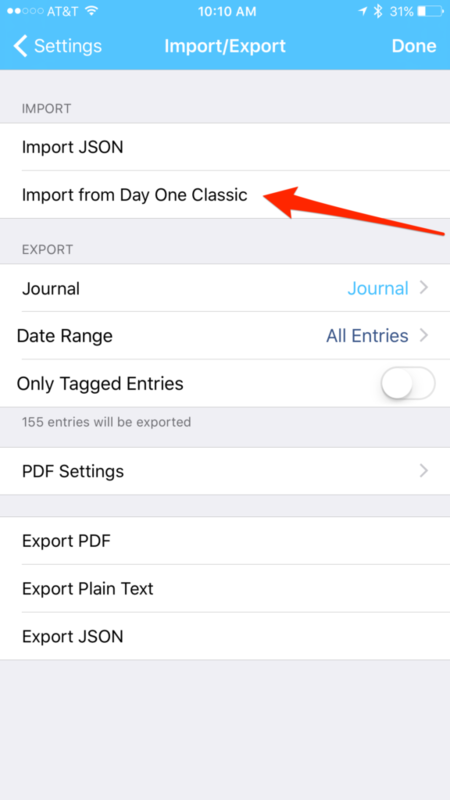 "No Day One Classic Journals found"
There is a known issue in iOS 11 where Day One 2.0 is not recognizing Day One Classic data. Please go to Day One Classic > Settings > Sync > and turn off iCloud. Then go to Day One 2.0 > Settings > Import/Export > Import from Day One Classic. Go to Day One > Settings > Import / Export and tap Import from Day One Classic. 2. You will be prompted if you would like to import your journal. Tap Import. You'll see a progress indicator. 3. After the import is complete, your newly imported data will appear in a journal titled Journal. If you've imported a journal previously, or already have a journal titled Journal, your imported data may appear in a journal titled Journal followed by a number. 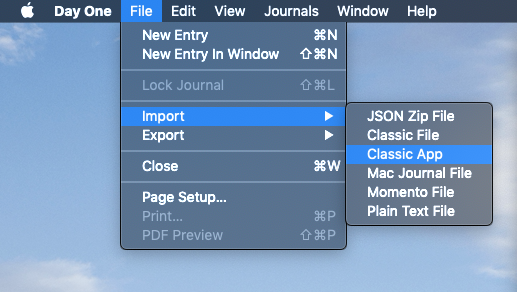 Go to File > Import and click Classic app. 2. You will be prompted if you would like to import your journal. Click Import. You'll see a progress bar.